Jade Mountain Club has been chosen to participate in Goût de France/Good France, a global celebration of French Cuisine. On the eve of Spring, March 19, over 1000 selected chefs from five continents will simultaneously present their menus extolling the merits of the French kitchen. This initiative was launched by Mr. Laurent Fabius, French Minister of Foreign Affairs and International Development, along with world-renowned 3- Michelin starred Chef Alain Ducasse. Jade Mountain’s Executive Chef, Jeffery Forrest, will reveal his menu based on French Gastronomy integrated with the rich and plentiful ingredients indigenous to Saint Lucia. Dishes will include Cured Lionfish with passion fruit caviar, fromage frais and Papaya mustard, Wahoo Aubergine and Emerald Mousse Chocolate from chocolate grown and produced onsite. The philosophy of Jade Cuisine embraces the same French concepts of culinary exploration and the use of fresh farm-to-table ingredients. The resort owns and runs their own organic plantation, Emerald Estate, a rich resource, producing bounteous fruits, vegetables and spices: turmeric, cashews, tamarind, mango, avocado, oranges, tangerines, guavas, papaya, coconut, breadfruit, yams and sweet potatoes. Cocoa plants are numerous on the grounds for guest to see and for the resort to produce their own estate chocolates. Jade Cuisine mirrors the French philosophy of respecting the principles of high-quality, environmentally responsible cuisine. How befitting it is that the French Cuisine which is on the World Heritage UNESCO list should be served on the Jades Club’s Terrace hovering above the Caribbean Sea and the majestic Pitons, also a world UNESCO World Heritage site. The food, service and ambience draw energy from the natural astonishing beauty of the mountains, seascape and sky. Leading Hotelier Honored by Government of St. LuciaST. LUCIA (March 9, 2015) - A visionary champion of excellence in the Caribbean hospitality sector has been honored by the Government of St. Lucia. 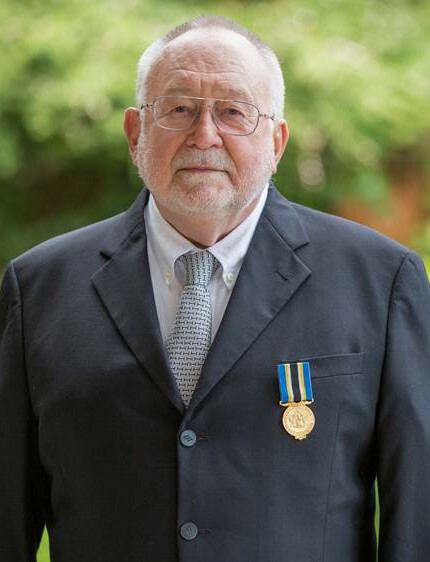 As part of Independence Day honors on February 22, 2015, Governor General Her Excellency Dame Pearlette Louisy, as Chancellor of the National Societies of Honour, awarded The Saint Lucia Medal of Honour (Gold) to Nick Peter Troubetzkoy, for his outstanding contribution to the development of the tourism industry in St. Lucia. Mr. Troubetzkoy is owner of the storied resorts, Jade Mountain and neighboring Anse Chastanet. The twin resorts often appear on lists of the world's leading properties. Focused on providing a unique, world-class experience, Troubetzkoy wanted to create a luxury experience that was also genuinely St. Lucian. Evidence of his deep appreciation for the island's beauty and culture can be seen in the original local artwork prominently displayed throughout Anse Chastanet and Jade Mountain, as well as the resorts' interactive activities featuring chocolate made from raw, organic cacao grown locally at the neighboring Emerald Estate. Troubetzkoy aims to keep the economic benefits of his endeavors on island by investing in the community and by providing training for St. Lucians. "There is an immense pool of talent here and I wanted to ensure this enormous amount of skill could be put into a resort which they could feel well connected to," he said. Since 1974, Troubetzkoy has been a deeply engaged member of the St. Lucian community. Originally from British Columbia, Canada he eventually became a St. Lucian citizen. He has played an important role in the creation of the Soufrière Foundation as well as the Soufrière Marine Management Authority, which conserves the fragile reefs and coastal waters. Troubetzkoy believes that St. Lucia as a destination still has much development potential and he hopes to continue giving back to the community. His dedication to the conservation of ecosystems when creating responsible tourism structures occurred at a time when the concept of sustainable tourism was just emerging. Throughout the daily operations of the resorts, Troubetzkoy's teams emphasize the importance of the resorts' kitchens using organic produce grown at the neighboring Anse Mamin and Emerald estates. More than a thousand local craftsmen and laborers helped to create Jade Mountain, which opened in 2006 and had an enormous impact on the community of Soufrière, providing long-term economic stability in one of the lesser developed areas of St. Lucia. The combined staff of Anse Chastanet and Jade Mountain is in excess of 500 people, and many hundreds more have worked for varying periods of time over the decades, especially during construction and property enhancement phases. 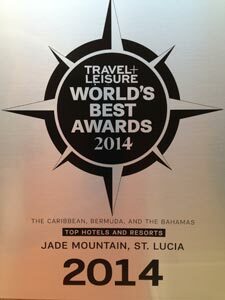 Conde Nast Readers Choice Awards 2014 Vote Jade Mountain, Saint Lucia Top Caribbean Resort Second year in a row! 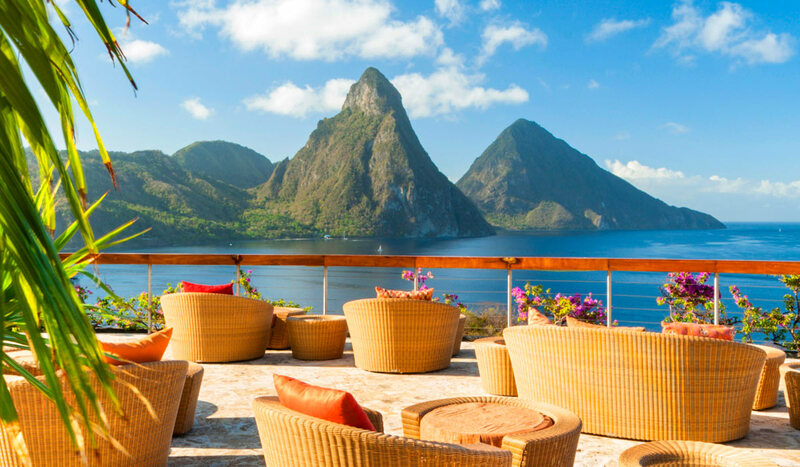 Soufriere, Saint Lucia, October 22, 2014… For the second year in a row Saint Lucia’s Jade Mountain Resort was rated the Top Caribbean Resort in the US Condé Nast Traveler 25th Annual Readers’ Choice Awards. Jade Mountain is also number 37 in the overall list of the TOP 100 Great Hotels and Resorts of the World. These prestigious awards follow Jade Mountain’s top spot placement in the recent Travel + Leisure’s World’s Best Awards 2014. This is an extraordinary tribute to Jade Mountain’s staff and owner’s philosophy of excellence. Owners Nick and Karolin Troubetzkoy are honored and attribute much of their success to the synergy created between the spectacularly scenic setting, Jade Mountain’s unique architecture and an exceptional resort team. The Jade Mountain service team is led by the resort butlers, called major -domos who are assigned to each guest at Jade Mountain and who look after their resort experience around the clock from arrival to departure. Jade Mountain has been personally designed and built by architect owner Nick Troubetzkoy in harmony with the environment, displaying and protecting the island’s indigenous beauty while offering excellence in service and comfort. The awe inspiring architectural design of Jade Mountain is rivaled only by the jaw dropping vistas of Saint Lucia's Piton Mountains, a UNESCO World Heritage site, which can be seen from every angle of the resort property. Jade Mountain’s sanctuaries are grand sweeping spaces, where bedroom, living room and an extravagantly sized private infinity pool form extraordinary platforms which appear to float out into nature. With the fourth wall entirely absent, Jade Mountain’s sanctuaries are stage-like settings from which to embrace the full glory of Saint Lucia’s Pitons and the Caribbean Sea. Wrapped around an infinity pool with a dazzling kaleidoscope of colors, the Jade Mountain Club restaurant caters exclusively to resident guests, celebrating James Beard Award-winning Chef Allen Susser. The development of the resort’s organic farm, Emerald Estate, yearly food festivals and the making of their own chocolate from tree to bar has brought yet another dimension to their “Jade Cuisine” . Daily rates per couple run from US 1125 to US 3050 for travel this fall and winter. 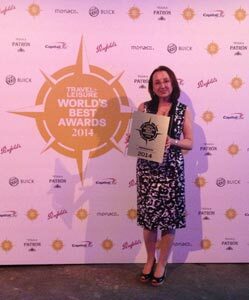 July 24, 2014: Jade Mountain’s Executive Director Karolin Troubetzkoy was at the Travel and Leisure World’s Best Awards party in New York City to receive Jade Mountain’s Top Caribbean Resort award. 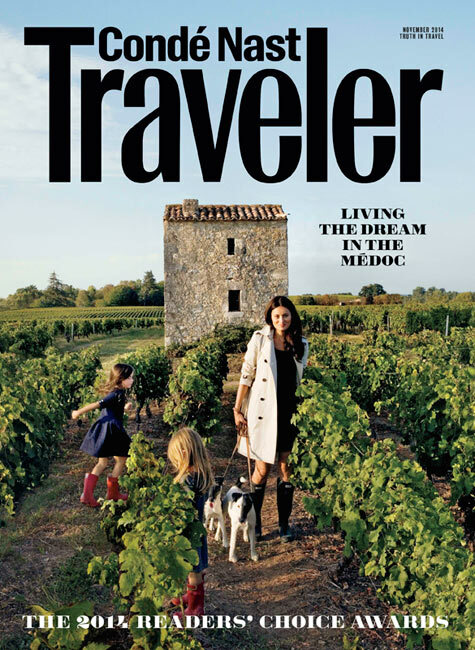 The award was presented by MSNBC's Morning Joe co-anchor Willie Geist together with Travel and Leisure’s Editor in Chief Nancy Novogrod and the magazine’s Editor at Large Peter Jon Lindberg. New York, NY, July 2, 2014 The leading travel magazine, Travel + Leisure, has just announced that Saint Lucia’s Jade Mountain (www.jademountain.com) has once again been named the Top Hotel in the Caribbean, Bermuda, and the Bahamas in the latest Travel + Leisure World’s Best Awards 2014. This is the 3rd time that the readers of Travel + Leisure have awarded this distinction to Jade Mountain, the 29-room AAA Five Diamond luxury resort known for its stunning sanctuaries with no fourth wall, mesmerizing in-room infinity pools, exceptional organic cuisine, and the highest level of personalized service. Owners Nick and Karolin Troubetzkoy are thrilled and deeply grateful for their guests’ recognition of their highly unique creation. “This award means a lot to us. Being a privately owned property, it makes us proud that together with our resort team, we can showcase that an individual property can provide the highest level of service and guest experience which often is expected to be deliverable by brands only.” says Mrs. Troubetzkoy, who also is the property’s Executive Director. The Jade Mountain experience is the culmination of attentive service provided by the loyal and highly engaged staff, a creative farm to table culinary approach and of course, the transfixing architecture showcasing Saint Lucia’s stunning beauty in the lush tropical surroundings of Jade Mountain’s 600 acre beachfront estate. Nick Troubetzkoy, the resort chairman, architect and builder started his love affair with Saint Lucia and the Caribbean with the opening of Jade Mountain’s sister property, Anse Chastanet in the 70’s. He then unleashed all of his creative passions in the design of Jade Mountain, which opened in early 2007: a bold architectural statement perched on a mountain top overlooking Saint Lucia’s landmark, the spectacular twin Pitons, a Unesco World Heritage site. At Jade Mountain, individual bridges lead to the resort’s stunning open-walled guest sanctuaries. In each of the 24 sanctuaries, bedroom, living area and an extravagant private infinity pool glide into one another to form extraordinary platforms floating out into nature. With the fourth wall entirely absent, Jade Mountain’s sanctuaries are stage-like settings from which to embrace Saint Lucia’s scenic splendor. “ In the design of Jade Mountain, It was imperative for us that this complex creative act was accomplished using the palette of indigenous materials lying at our very door step. Our mantra throughout, as well as being location, location, location, was as importantly also local, local, local”, says Mr.Troubetzkoy. The Jade Mountain guest service team is led by the resort major –domo butlers who are assigned to each guest and who look after their guests’ resort experience around the clock from arrival to departure. Mrs. Troubetzkoy worked with consulting chef and James Beard Award Winner Allen Susser to create Jade Cuisine, now famous for its creative menu, indigenous food festivals and on-site chocolate laboratory. Meals are served in the Jade Mountain Club, wrapped around an infinity pool with a dazzling prism of colors. The results of the Travel + Leisure World’s Best Awards 2014 will be featured on http://www.travelandleisure.com/worlds-best/2014 and also, in the August issue of Travel + Leisure, on newsstands July 18. Soufriere, Saint Lucia, May 15, 2014— Believe it or not, stays at Jade Mountain are becoming even sweeter. Guests are invited to make their own chocolate in the brand-new chocolate laboratory. 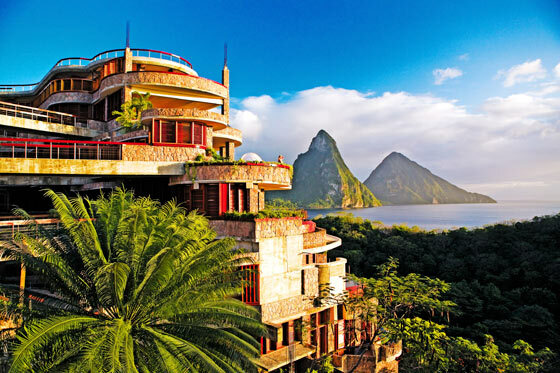 Jade Mountain is not only one of Saint Lucia's most scenic resorts, it is also the island's only bean to bar organic single estate boutique chocolate maker. There are over 1000 cocoa trees on the resort estates, including the organic farm Emerald's in the Soufriere Hills. For the past 3 years, Jade Mountain has hand-crafted Emerald Estate Chocolate for the enjoyment of their guests and with the opening of its chocolate laboratory, guests are now able to not only taste but participate in the making of the chocolate. An awakening journey through the flavor palate of cocoa and chocolate. The first step in chocolate production is to taste the cocoa bean, and the last step is to end the tasting with the strongest type of cocoa mass while sampling all steps in between. As a culmination of the sensory tasting session, guests get to sample some homemade truffles and a variety of Emerald Estate Organic Chocolate bars. Tuesday from 10:00 am - 10:30 am in the Emerald Restaurant. Offered complimentary to resort guests. Taking the Chocolate Sensory Tasting a step further, guests participate in the actual making of chocolate in the Chocolate Lab. Guests learn the basic techniques of making chocolate, tempering chocolate, creating their own fudge and personalized chocolate bars. Tuesday from 10:30 - 11:30 am in the Chocolate Lab. $45 per person; Minimum 2, maximum 6 persons per session. Guests will visit the Emerald Estate for a Cocoa Tour to experience the complete cycle of "Tree to Bar" production, learning about the history of chocolate in the Caribbean and the production process. At Emerald Estate, guests will first witness the natural side of cocoa including tasting raw cacao while discussing the fermentation, sun drying, and polishing of the beans. 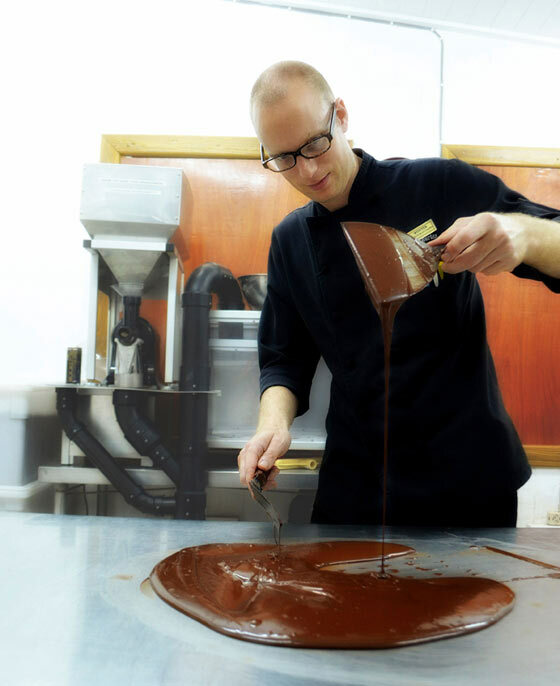 Then they will return to the Chocolate Lab, where the host will elaborate on the technical part of making the perfect chocolate bar. This 2 hour guided experience takes guests through cocoa bean roasting, grinding and conching in the making of chocolate to create the perfect snap and shine. Along the way, guests will enjoy an invigorating cup of local cocoa tea and the Emerald Estate's organic chocolate bars that range from 60 %, 70 % and 92 % Bittersweet. Guests will receive a Bar of Emerald Estate Organic Chocolate as the farewell souvenir to take home. Monday from 9:00 - 11:00 am, $75 per person. Minimum 2, maximum 6 persons per session. In close collaboration with the resorts' Consulting Chef Allen Susser, Jade Mountain's Emerald Estate Organic Chocolate and Chocolate Laboratory is managed by the resorts' very own Chocolate Alchemist and Director of Pastry Wouter Tjeertes. For the past 17 years, Wouter Tjeertes worked in a number of countries before calling St. Lucia his home. Born in The Netherlands, he knew he wanted to be a Pastry Chef from a young age and worked his way up through several highly recognized pastry shops and hotels in Europe and the Caribbean. Along the way, he developed a strong passion for cocoa and chocolate, which led to a deep-rooted love affair with the Caribbean region. He says, "Making use of the incredible flavor palate the Caribbean has to offer and maintaining the highest possible standards of quality are my greatest obsessions." Chocoholics can get a taste of Jade Mountain and its Estate Grown Chocolate with the resort's Chocolate Alchemy package. Chocolate Alchemy includes a chocolate welcome amenity and cocktail, Chocolate Lovers' Breakfast in Bed celebration, a 1 hour chocolate infused spa treatment for each person, a learning excursion to the resort's Emerald Cocoa Estate, a Chocolate Sensory tasting, finally followed by an interactive class in Jade Mountain's chocolate laboratory to learn basic techniques of making chocolate, tempering chocolate, creating your own fudge, and making a personalized chocolate bar. Also inlcuded are airport transfers and breakfast and dinner daily. The Chocolate Alchemy package is combinable with the resort's free night promotions: Up to 2 nights free are offered this summer. A 4 night stay on basis of Jade Mountain's Chocolate Alchemy package starts at US 5010 per couple this summer. Tranquility, Romance, Adventure: ANSE CHASTANET is one of the Caribbean's most panoramic resort hideaways. Nestled amidst a 600 acre estate with two soft sand beaches bordering pristine coral reefs, ANSE CHASTANET offers excellent diving facilities and soft adventure activities. Rising majestically above sister property Anse Chastanet's 600 acre estate with 2 beaches, JADE MOUNTAIN is an architectural marvel celebrating Saint Lucia's stunning scenic beauty. The 24 open -walled sanctuaries are grand sweeping spaces each with an extravagantly sized private infinity pool floating out into nature and to amazing views. Enjoy fine dining options plus an entirely vegetarian restaurant using produce from the resorts' organic farm Emerald's. Resort activities include yoga, daily escorted walking or hiking tours, jungle biking on 12 miles of private trails, watersports with an excellent snorkeling and scuba diving centre. At the resort spas, a wide range of treatments are available including aromatherapy, ayurveda, and couples treatments and of course, chocolate infused spa treatments. Cocoa history on Saint Lucia dates back to the early 1700's. There are many plantations on the island that have been harvesting and producing cocoa for many years supplying the local market and culture as well as becoming a part of the international commodity of Cocoa. In celebration, the month of August has been declared the "Month of Chocolate". Both Jade Mountain and its sister property Anse Chastanet have been named one the world's top Caribbean hotels by Condé Nast Traveler and Travel + Leisure. Travelers looking for a stylish early spring getaway can take advantage of Jade Mountain's 3rd night free promotion for travel March 29 - April 15 inclusive. Travelers staying 6 nights receive 2 nights free. If a meal plan is pre-booked the free nights will enjoy same meal plan free of charge. The Spring Getaway promotion is offered in the Jade Mountain's Sky and Star categories. The daily rates per couple are US $1,350 / $1,825 in Sky and Star respectively. To add breakfast and dinner, add US $200 per couple per day. Alternatively, an all-inclusive plan can also be added, at US 360 per couple daily. All above rates - rooms and meals - are subject to 10% tax and 10% service charges. Total Romance is always in the air at Jade Mountain and the resort offers an all- inclusive package to match the romantic mood: Travelers staying for a minimum 5 nights throughout 2014 can take advantage of Jade Mountain's Total Romance Package, offering 1 night free in Sky, Star and Moon Sanctuaries. On basis of the all inclusive Total Romance package, a 5 night stay starts at US 8,902 for travel until April 15, and US 7,838 for travel Apr 16 – May 31, 2014.
accommodation in category chosen, all tax and service, airport transfers both ways, breakfast, lunch, afternoon tea and dinner, beverages, off property excursions as well as resort activities such as a guided boat snorkel trip, a resort scuba diving course for beginners or 2 dives for certified divers. Also included are a bottle of champagne, one hour Swedish Massage for 2, 1/2 day Jungle Biking in Anse Mamin Valley, 2 resort t-shirts, a half day sailing on skippered resort yacht Serenity, and an anniversary certificate of US 500 to be used on a return visit. On March 10, 2014: The beautiful Anse Mamin plantation belonging to the 600 acre estate of Saint Lucia sister resorts Anse Chastanet & Jade Mountain was featured in the final episode of ABC's hit primetime reality series The Bachelor. The episode aired Monday, March 10th, 2014, at 8/7c on ABC. The stunning serenity and beauty of the Anse Mamin plantation makes it the perfect spot for the Bachelor's romantic finale. Anse Mamin is part of the private 600 acre estate encompassing Anse Chastanet & Jade Mountain; it is composed of a secluded beach and lush tropical Garden of Eden with historic remains of an 18th century plantation including a 1.5 Million gallon water reservoir and ancient waterwheel. Guests staying at Anse Chastanet and Jade Mountain can enjoy romantic walks through the plantation, go birdwatching, or jungle bike on the many bike trails. The Anse Mamin beach is a popular choice for the ultimate private Castaway dinner whatever special occasion is being celebrated. - Visit the picture gallery featuring Anse Mamin. - Learn more about Jade Mountain. - Learn more about Anse Chastanet. Both Anse Chastanet and Jade Mountain offer a variety of Romance and Wedding Packages. The resorts are a favorite destination wedding location and have a wedding specific websit - Elope To Paradise Weddings. Celebrate with the Resort's Red Rose Romance Promotions February 25, 2014, Soufriere, Saint Lucia...The Bachelor has been lured, once again, to the irresistible enchantment of Saint Lucia. Saint Lucia Resorts Anse Chastanet and Jade Mountain will be featured as the cast and crew travel to the island for the final two episodes of The Bachelor. The newest Bachelor, Juan Pablo Galavis, comes one step closer to potentially completing his family. The episode is scheduled to air Tuesday, February 25, 2014, at 8/7c on ABC. And don't miss the March 10 finale to see the location of the final Red Rose Proposal and of course, to find out who will be the Bachelor's chosen one! The resorts' 600 acre estate embodies the intoxicating natural beauty of Saint Lucia. Private dinners are arranged on the beach under the stars or on Jade Mountain's Celestial Terrace towering above the sea. It is no wonder that Bride's Magazine called Jade Mountain "Best Honeymoon Destination in The Caribbean 2013", Luxury Travel Magazine calls Anse Chastanet "One of the Best Places to Propose" and For The Bride Magazine calls both Jade Mountain and Anse Chastanet "...over the top on the romance meter." Celebrate Jade Mountain's Red Rose Promotion by reserving the Take 5 Total Romance Package with the 5th night free in selected categories. The Total Romance Package includes: accommodation for number of nights in category chosen, all tax and service, airport transfers both ways, breakfast, lunch, afternoon tea and dinner, all drinks including house wine (but not bottled wines and champagne), welcome cocktail, tour of Volcano, Sulphur Springs and Diamond Mineral Baths, guided tour of old French Colonial Plantation of Anse Mamin, drinks package in room fridge, culinary amenity, use of tennis court and equipment, snorkeling, kayaking, mini-sailing, windsurfing, use of beach chairs and beach towels, a guided boat snorkel trip, a resort scuba diving course for beginners or 2 dives for certified divers, bottle of French champagne, one hour Swedish Massage, 1/2 day Jungle Biking in Anse Mamin Valley, 2 resort t-shirts, half day sailing on skippered resort yacht Serenity, an anniversary certificate of US$ 500 to be used on a return visit. (Unused features are not refundable). Travel dates are March 1- Dec 19, 2014. Book by December 12, 2014. On basis of our all inclusive Total Romance package, the TAKE 5 rates are US $ 8,902/ 11,142 / 12,442 (Jan 3 - Apr 15, 2014) 6 night stay add: US 2,018 / 2,578 / 2,903 US $ 7,838 / 9,726 / 11,142 (Apr 16 - May 31, 2014) 6 night stay add: US 1,752 / 2,224 / 2,578 US $ 7,366 / 9,090 / 10,554 (Jun 1 - Oct 31, 2014) 6 night stay add: US 1,634 / 2,065 / 2,431 US $ 7,838 / 9,726 / 11,142 (Nov 1- Dec 19, 2014) 6 night stay add: US 1,752 / 2,224 / 2,578 Airlines servicing Saint Lucia from the U.S.A. and Canada are Jetblue with a non-stop flight from JFK daily, United Airlines from Newark, American Airlines from Miami, Delta from Atlanta, Air Canada and West Jet from Toronto. On ABC's hit primetime reality series The Bachelor, one lucky man is offered the chance to find true love. A single and eligible Bachelor embarks on a romantic journey, getting to know a number of beautiful women, gradually narrowing the field as he continues his search for his soul mate. At the end of this romantic voyage, if he has found the one, will there be a proposal - and will she say yes? Hosted by Chris Harrison, The Bachelor is produced by Next Entertainment in association with Warner Horizon Television. The 18th season of The Bachelor airs Mondays 8/7c on ABC. For more information on The Bachelor, visit http://abc.go.com/shows/the-bachelor.